Our Attorneys | Swaray Law Office, LTD.
Swaray Law Office, LTD. is built and organized with an eye on a diverse body of staff reflecting all ethnicities, races, cultures and national origins of high quality productivity and unparallel experience in our practice areas. Amadu Edward Swaray is the founder of Swaray Law Office, LTD. Swaray has a joint honors political science and history undergraduate degree from the premier University of Ghana, in West Africa. 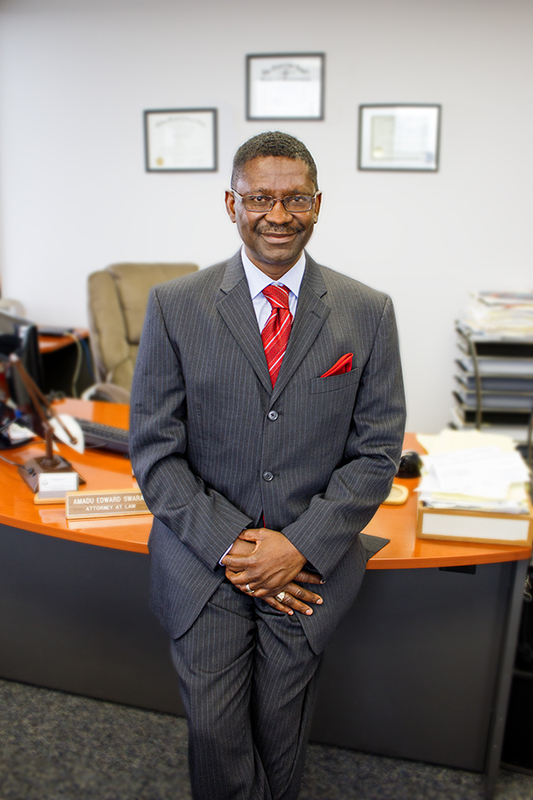 He immigrated to the United States from Sierra Leone, West Africa in 1992, and earned his Juris Doctor degree in law from the William Mitchell College of Law in St. Paul, Minnesota, and was subsequently admitted to the Minnesota State Bar. Swaray is a member of the Minnesota State Bar Association (MSBA) and American Immigration Lawyers Association (AILA) and profoundly involved in many community based organizations in the United States. He has a wealth of experience in Immigration, Criminal, Family and Personal Injury areas of law. What sets Swaray apart from many lawyers in the profession is his deep commitment to service and care for his clients and the hunger for an America with justice for all. Contact Swaray Law Office, LTD.